Temples housing Srivishnu and glorified by the paasurams (poems) called naalaayira dhivyap prabhandam composed by twelve great souls called aazhvaars, are special to Sri Vaishnavas. Such of those temples are called Divyadesams – most loved places. Totally, there are 108 such divya desams of which 106 are in our holy Country. The remaining 2 are – Ksheerabdhi – milk ocean and the other Paramapadam the supreme abode of the (Supreme) God of the Gods viz., Sriman Narayana. This is the place of Moksha – liberation of all Srivaishnavites. Alwar Thirunagari houses the Lord "Adi Nathan (moolavar) and "Polindu Nindra Piran" (Utsavar). In this temple Swami Nammalvar did penance inside the trunk of a tamrind tree (it is still available). The Lords of Nava Tirupathi temples came and gave darshan to Nammalvar in his Yogadasa. 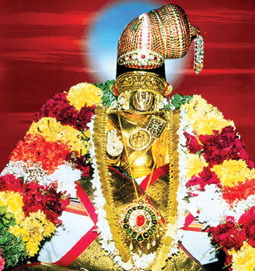 Even to-day, on the 5th day of Vaikasi Utsavam (to celebrate the awataram of Nammalvar – star Visakam) the Lords of Nava Tirupati arrive at Alwar Thirunagari to give darshan to Nammalvar and in turn receive the sweet outpourings (divya prabhandam) of Sri Nammalvar. Sri Madurakavi Alwar (the one for whom "Nammalwar" is the number one relinguishing the lord himself to the second place) prays and praises Swami Nammalwar. All the nine Lords appear on the Garuda Vahana while Nammalwar adorns the Golden Hamsa (Swan) Vahanam and Sri Madurakavi Alwar follows in the "Paranki Chair". It is a great sight which are must aspire for atleast once. The Nava Tirupathis have been renovated with great care and sincerity. Arrangements have also been made for regular poojas. The temples can be visited nowadays thanks to the great services being rendered by Indian Culture and Heritage Trust. Site supported by Sinna Iyengar Family,Perungulam India.